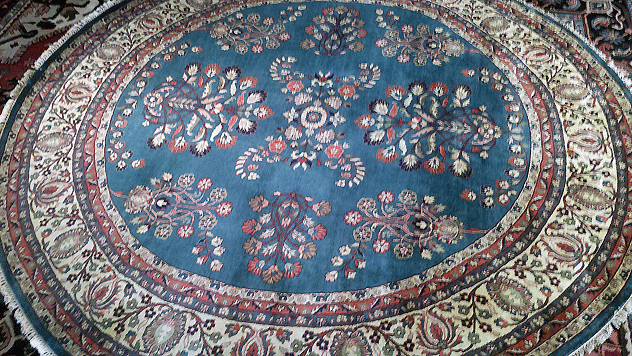 A beautiful blue round hand-knotted Oriental rug with a Persian Sarough design for Lehigh Valley PA home’s large foyer. Gallery in historic Doylestown Bucks County, near Philadelphia and Princeton. they have many more rooms for which to buy rugs – the excellent sale price. at the best prices – visit www.nejad.com or call 215-348-1255. Serving the Lehigh Valley for over 30 Years. This entry was posted in Designer's notes and tagged for the best selection in round rugs at the best prices visit Nejad, Lehigh Valley Clients Choose Blue Sarough Round Rug From Nejad Rugs in Doylestown, Nejad Rugs has been serving the Lehigh Valley for over 30 Years, Nejad's enormous selection of fine handmade round rugs ready for immediate purchase by Theresa Nejad. Bookmark the permalink.